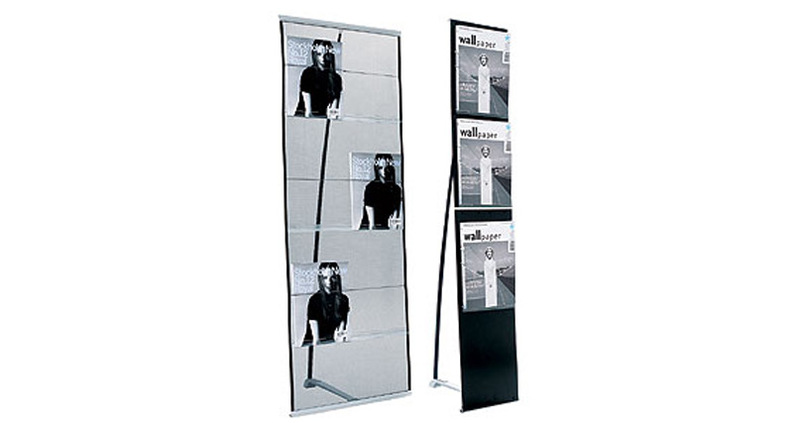 The Expand brochure holder is available in two different widths – the 500mm wide version has six generously sized pockets, whilst the 270mm wide version is perfect for those situations where space is limited. This stand is extremely lightweight and easy to set up – it’s actually designed similarly to a tension banner, so the front unrolls and is supported by a central pole that fits into the stabilising foot at the rear. At less than 2kg, this brochure holder isn’t all that difficult to transport or store. Even so, we supply a black carry bag that helps you to protect the stand from damage. This depends on which version you opt for – the larger one will be 500mm wide x 1360mm high, whereas the smaller one will be 270mm wide x 1360mm high. What size documents can the pockets hold? All of the pockets are designed to hold A4 portrait documents, although they can accommodate smaller literature if desired.